Your kitchen remodeling company is the key to completing your project on time and on budget. 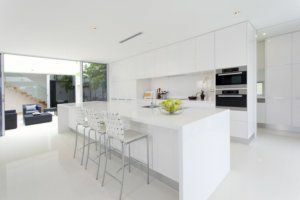 At Republic West Remodeling, we believe that communication can make or break the relationship between a homeowner and a kitchen remodeling services company. In fact, a crucial part of any remodeling project is to have complete transparency and clear lines of communication with your remodeling team. The vast majority of kitchen remodeling services companies assign a project manager as the point person. Also known as the “go-to” person, a project manager oversees communication about every aspect and detail of your kitchen remodel. They also talk daily with all team members involved in your project. The project manager should communicate with you every day, typically via e-mail, so you have a written record of the completed work and what tasks are next on the list. They should also provide details that recap what will happen today, and what they have on the schedule for tomorrow. The foremost concern on a kitchen contractor’s mind, should a problem arise, is how you, the client, will be impacted. A good kitchen remodeling contractor recognizes and respects that their primary role is to support you throughout the process. Even in the best circumstances, kitchen remodeling can sometimes be challenging. When issues arise, a variety of emotions can surge. A smart contractor should understand and never dismiss your feelings, and create a productive dialogue so successful problem solving takes place. Kitchen remodeling, just like any other type of construction project, is never simple. When unexpected issues arise, we believe it is best to “roll with it” and trust your kitchen remodeling services team. At the start of your project, ask your project manager for an estimated time frame for each step of your kitchen remodeling project so that you go into the adventure with your eyes wide open. With Republic West Remodeling, your kitchen remodeling project will be a dream come true throughout the entire design and construction process. Over the years, we have learned how to efficiently and effectively complete projects to every customer’s expectation. Contact us today for details about our luxury kitchen remodeling services in Phoenix.